United States of Wine Hall of States (April 23): Twenty-four members of Congress were in attendance including Senator Saxby Chambliss and Congressman Mike Thompson, who served as Honorary Chairmen and auctioneers. Collectors Dinner (May 1): Eighty guests attended a dinner at Charlie Palmer Steak, where they brought their own bottles and lightheartedly competed to see who could out-do one another with their contributions. Gaja, Screaming Eagle, Mouton Rothschild, Sine Qua Non, and Le Pin were among the wines shared. Private Series Dinner (May 2): Fifteen dinners were hosted across DC at Ambassador’s residences, embassies, restaurants, and private homes. David and I attended the Ramey dinner at the Ritz Carlton’s West End Bistro. I was extremely impressed by Chef Devin Bozkaya’s preparations – the perfect amount of food with great flavor combinations. David Ramey also attended the dinner and was a warm and friendly host to our small group. Press Luncheon (May 3): Ten winemakers from Bordeaux and two winemakers from the U.S. poured their wines for 22 members of the press and guest sommeliers. Many of the Bordeaux producers brought in the new 2010 vintages, which were exciting to taste. Vintner’s Dinner (May 3): The big shebang! 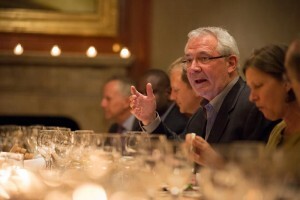 A black tie dinner featuring the wines of the first growth of Bordeaux and dinner prepared by Paris’ Michel Rostang. During the auction, a record breaking lot for the Cannes Film Festival, donated by Vin Roberti and his future bride, was sold twice for a total of $110,000. Grand Tasting Auction (May 4): Ten representatives from amazing properties in Bordeaux poured the current release and an older vintage for a formal tasting. I wasn’t able to attend this, but several Terroirists did attend and sent texts and pics that made me beyond envious. Caviar stations happened. As did 200+ silent auction lots and a live auction followed by a 1950’s doo wop group.